Shabbos might be great in Mezhbuzh (the Ukrainian resting place of the Baal Shem Tov, the founder of Chasidism), but I must say that Shabbos in Yerushalayim is pretty great, too. I got tons of sleep, and had nice alone time at the kosel. To finish it off, havdallah at the kosel was very nice. Friday night, I ate with two friends and a random odd man at the home of one of my rabbis in yeshiva. His kids are very cute and upbeat, and with Shimon, myself, and the rabbi singing, we had a very nice time with the meal, stories of real Torah tzadikim (righteous people), such as Reb Shlomo of Bobov and the Alter Klausenburger Rebbe. The random odd man was dressed in a way to make himself overtly out of place, and he was introduced to us by the rabbi as "someone who has taken a taanis dibur for Shabbos". Now, the point of a taanis dibur (a fast from speech) is to (1) make us concentrate on what we say, so that we can work on our speech, and (2) to take something that was used for gossip (our mouths) and use it only for prayer and to speak words of Torah, thereby making a reparation with the item that did sins in the first place. However, this man decided, for whatever reason, that he wouldn't even speak words of Torah. Basically he just listened through the meal and flapped his arms and hands when he wanted something...give me a break. This, as another rabbi said when the story was relayed to him, is just absurd. "Fundamentalism of any stripe is very suspect," he said. The next day, I went with the same friends (minus odd "taanis dibur" guy) to another rabbi's apartment. After a rather short, but very nice, meal, I walked by myself to the kosel. Upon arriving, I davened mincha, and then watched people. On Shabbos, the kosel is so full of diverse people, that it is a perfect people to just find a spot and watch. As new groups of tourists arrive, it always makes me giggle to see the people (who completely ignore the 50-odd signs around making restrictions clear) get offended when people make them stop using phones, cameras, and other things forbidden on Shabbos. One thing that was especially laughable was when a large group of people from New York arrived. The group, by mere virtue of touring on Shabbos, was obviously not religious, and one of the women was sporting a bright pink yarmulke at the top of her head. As an American, I have seen this sort of thing many times, with non-religious Jews expressing their non-religiousness by misinterpreting religious ideas. However, Israelis are not at all used to such things. In Israel, if someone isn't religious, they tend to not associate themselves with religious symbols, and even on the rare even that they attend religious services, it is 999 times out of 1000, an Orthodox service. As this woman stood on the edge of the group, the religious Israelis were all drawn to her. Eventually, a well-meaning woman approached her to let her know that only men had to wear yarmulkes at the kosel. This apparently offended the wearer, and she soon launched into mocking the religious people at the kosel, and saying that our control of Israel is insane. 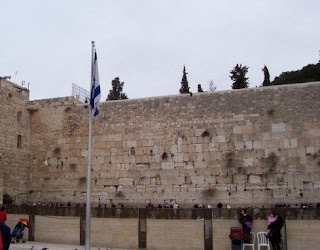 I stayed at the kosel the rest of the day, eating seuda shlishis (the third meal of Shabbos) there, and making havdallah with a huge crowd gathered around the entrance to the men's side of the wall. All in all, it was a very nice Shabbos. we would be honored to sponsor you!